Like a thieves in the night, hackers wormed their way into MoneyHorse Games’ computers and deleted data from their upcoming platformer, Glorious Leader! The hackers locked the team out of their computer and website right in the middle of the Kickstarter campaign to raise the funds they needed to finish the game. The team have decided to cancel the Glorious Leader! Kickstarter and potentially end development of the game. “As many of you know, over the holidays we were victims of a hack inspired by the attack on Sony,” MoneyHorse wrote in an update to Kickstarter. “The hackers destroyed data pertaining to Glorious Leader! and other projects we had in development and locked us out of our own computers and wesbite. The timing couldn’t have been worse as it hampered our ability to attend to the Kickstarter project. 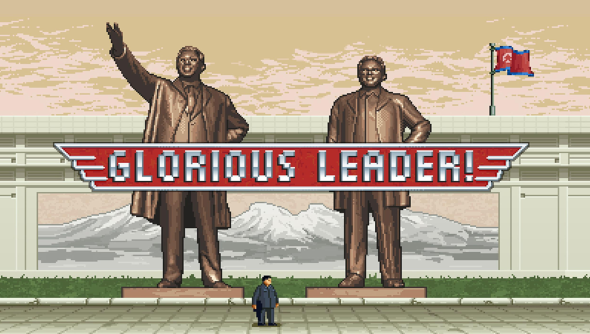 If you’re looking for a North Korea parody flash game, Rodman vs Kim is still a thing.